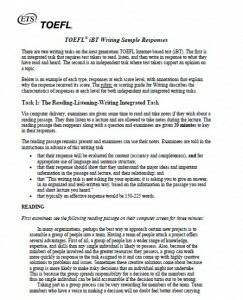 There are two writing tasks on the next generation TOEFL Internet-based test (iBT). The first is an integrated task that requires test takers to read, listen, and then write in response to what they have read and heard. The second is an independent task where test takers support an opinion on a topic. Below is an example of each type, responses at each score level, with annotations that explain why the response received its score. The rubric or scoring guide for Writing describes the characteristics of responses at each level for both independent and integrated writing tasks. Via computer delivery, examinees are given some time to read and take notes if they wish about a reading passage. They then listen to a lecture and are allowed to take notes during the lecture. 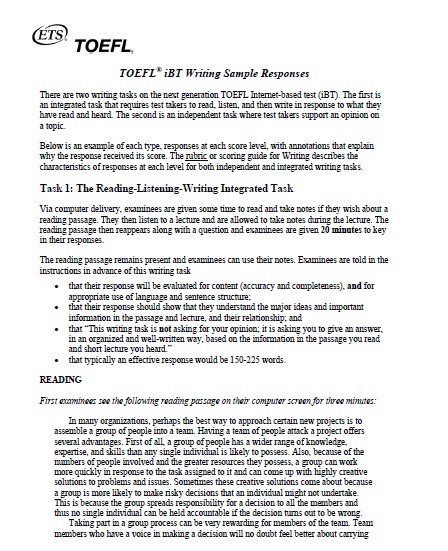 The reading passage then reappears along with a question and examinees are given 20 minutes to key in their responses. that typically an effective response would be 150-225 words. PERHATIAN: Harap download file TANPA DOWNLOAD MANAGER karena kemungkinan besar akan gagal. Jika tidak bisa download via alternatif link, silakan dicoba kembali. Writing prompts is a way of inviting student to think critically and creatively.